The holiday season is coming up and Christmas is only 43 more sleeps away. 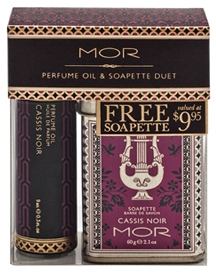 If you haven't already, it's time to think about gifts and presents for family and friends. Present buying does get costly and can add up very quickly; before too long you can easily blow your budget out of the water and still haven't found gifts for everyone on your list. Although innocent looking enough, this little slimline palette packs a real punch. 12 beautiful silky colours that applies like a dream (and with minimal fall out too I might add). They all contain fine shimmer (except the black which is matte and can be used wet as an eye liner) and are highly pigmented. I had a MUA apply a look on me and upon seeing the results, I knew I had to have it. 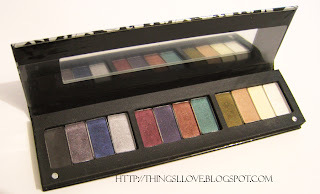 The gorgeous looks one can create with the versatile colours are endless; the best part about this mini version of this UK makeup brand is the mini price. Who does not love a gift with purchase? 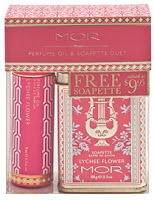 That's right, the perfume roll-on oil alone will normally set you back A$19.95 but released just in time for the holidays, the duets comes with a free soapette (valued at A$9.95) in the most adorable collectable tin, which you can use later to put your bobby pins and other tiny trinkets in. Pop Beauty is available at Kit Cosmetic counters. 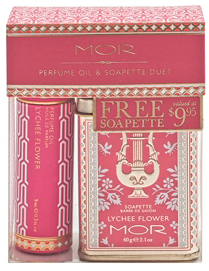 MOR is available in Myer, David Jones, selected stores and MOR online. 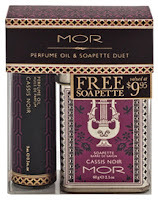 MOR perfume oil and soapette duet was sent to me for review.